Note: This is a list of every band that either performed live at The Bronze or had their music played at the club. The list includes only the episodes in which The Bronze appeared. For more “Buffy” music, you can see our online store. Dead Man’s Party — Four Star Mary plays the songs of Oz’s fictional band Dingoes Ate My Baby. In this episode, they play “Never Mind” and “Pain” from “Thrown to the Wolves” and “Sway” from from “Four Star Mary.” “Pain” is on the Buffy soundtrack. Faith, Hope, and Trick — “The Background” from Third Eye Blind’s self-titled album plays as Buffy and Angel dance in the slayer’s dream. Darling Violetta plays “Cure” from “The Kill You EP” as Scott asks Buffy to dance, and the band’s “Blue Sun” from “BathWaterFlowers” is playing as Faith tells stories of slaying. Revelations — Four Star Mary plays the songs of Oz’s fictional band Dingoes Ate My Baby. In this episode, they play “Run,” which was not released on an album. The Wish — The Spies play “Tired of Being Alone” from “Toy Surprise Inside” as Buffy, Xander, and Willow are watching Cordelia at the Bronze. Plastic plays “Dedicated to Pain” as Xander and Willow, as vampires, walk inside the Bronze to see the Master. The Zeppo — Supergrass plays “G-Song” from “In it For the Money” as Xander and Lysette are at the Bronze. Bad Girls — Curve plays “Chinese Burn” from “Chinese Burn” and “Come Clean” for the whole scene at the Bronze. Consequences — Kathleen Wilhoite plays “Wish We Never Met” from “Pitch Like a Girl” as Willow is crying in the bathroom. Doppelgangland — K’s Choice plays “Virgin State of Mind” from the Buffy soundtrack when Willow, as a vampire, first arrives at the Bronze. The Prom — The first song at the prom is Fatboy Slim’s “Praise You” from “You’ve Come a Long Way, Baby.” Kool & the Gang’s “Celebration” from “Celebrate” is what the hellhounds hear on their way to the gym. Cracker plays “The Good Life” from “Gentleman’s Blues” when Buffy arrives at the event. The Lassie Foundation plays “El Ray” from “Pacifico” and their self-titled album when Giles and Wesley discuss Cordelia. 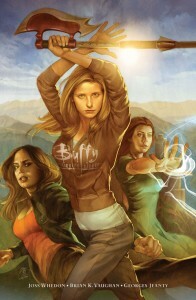 The Sundays play “Wild Horses” from “Blind” and the Buffy soundtrack (the song is a cover of the original Rolling Stones song on “Stripped“) while Buffy and Angel dance. Graduation Day (Part One) — Faith is listening to Spectator Pump’s “Sunday Mail” from “Styrofoam Archives” when Buffy enters her room.